The Maryland Minimum Wage and Overtime Law is a minimum wage law poster by the Maryland Department Of Labor, Licensing and Regulation. This is a mandatory posting for all employers in Maryland, and businesses who fail to comply may be subject to fines or sanctions. This poster must be posted in a conspicuous place where all employees will see it. This poster describes what the Minimum Wage is for tipped and untipped employees, when the Minimum Wage will go up, how much the Minimum Wage will be when it goes up, information on Overtime, as well as exceptions to the Minimum Wage Law and Overtime Law, and where to get information or file a complaint of a violation of rights under this law. It appears you don't have a PDF plugin for this browser. 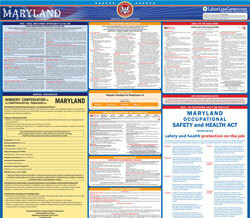 Please see the link below to download maryland-minimumwagelaw.pdf. EMPLOYERS ARE REQUIRED BY LAW TO POST THIS INFORMATION. PAY RECORDS MUST BE KEPT FOR 	3 YEARS 	ON OR ABOUT THE PLACE OF WORK. PENALTIES ARE PRESCRIBED FOR VIOLATIONS OF THE LAW. Most employees must be paid the Maryland State Minimum Wage Rate. must equal at least the State Minimum Wage Rate. employees at least 85% of the State Minimum Wage Rate or $7.25, whichever is higher. for the first 6 months of employment.